I can’t say that I always knew or even suspected that Glenn Wolff and I would team up on another Christmas book one day, but I’m elated that we have, more than 15 years further on. Doing Flight of the Reindeer: The True Story of Santa Claus and His Christmas Mission with him and the designer J Porter in 1996 was an entirely thrilling experience for me: excitement from beginning to end. Then, suddenly, it was done—always a shocking proposition with something as encompassing as a book project. Glenn and I both went on to other things, and although Flight did well for us, I didn’t necessarily consider writing another Christmas book. We kicked around an Elfish adventure for kids—we might return to it one day—but agreed that we didn’t want to force anything, and Flight didn’t seem like a book that would lend itself to a sequel, not without forcing. It had seemed to fall out of the sky pretty much fully formed—as an idea, I mean. Now it was done. Time to move on to something less Yule-scented, and Glenn and I did so with our second collaboration, which was about Atlantis. But part of what led to Flight of the Reindeer was, as you might imagine, a personal affinity for all things Christmasy. I remember that, once Flight had lodged itself in my noggin as something that needed to be done, I thought: that guy who draws nature pictures for the Times—his work is a perfect balance of real and wondrous, which is to say: just right for Christmas. After a call to a friend at The Paper of Record and a quick trip through her Rolodex (remember Rolodexes? ), I found Glenn, who was indeed the perfect person (and talent) to, so to speak, finish the picture. To bring our shared vision of Christmas alive. Then we did Atlantis and then Glenn helped me with a jacket for a memoir and then we thought about a bird book or website (we may pursue that, too, one day), and then . . .
And then, this second Christmas notion fell out of the sky. As with Flight, it was almost fully formed before I knew what, precisely, to do with it. I called Glenn when the words were done. 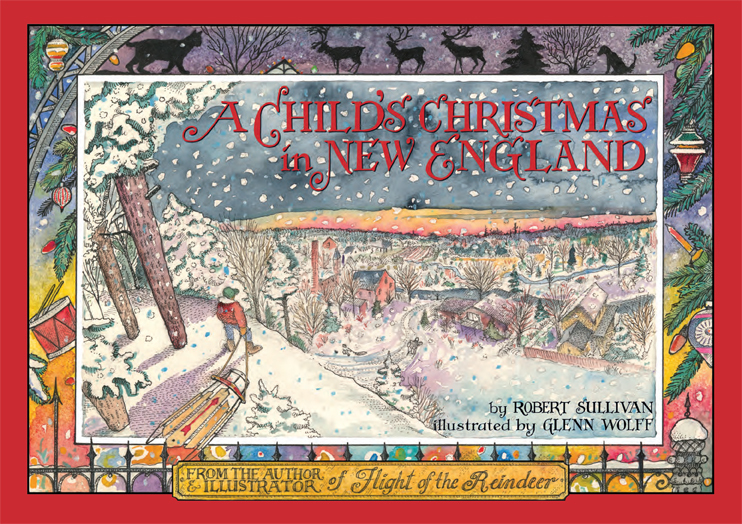 For those who may be interested, here’s how our new collaboration, which will be published as A Child’s Christmas in New England in 2013, came about. One of the reasons I was so pleased to do Flight as my first “own” book—a first book outside of the day job at Time Inc.—was because, as I say, I had long been a Christmas nut. I’ve always been keen on Christmas lore, legend and literature—nothing short of a Christmas lit junkie, in fact. When I was a kid I couldn’t get enough Santa tales between Thanksgiving and the day itself, and in current Decembers during my commute to the city, I will devour the cheesiest Christmas-themed murder mysteries, of which there are dangerously too many. It helps kindle the season. The first Christmas collection I bought—I remember this distinctly—was Pearl S. Buck’s Book of Christmas. I see myself Christmas shopping at the department store, flipping through the hard-cover volume, and immediately adding in to the day’s haul. I liked everything in it, from the Dickens and Dostoyevsky to “Solange, the Wolf Girl” to the “boys’ stories”: Frank R. Stockton, L. Frank Baum’s “A Kidnapped Santa Claus,” “Christmas Eve on Lonesome,” by the sadly forgotten John Fox, Jr. Thus began a lifelong hunt for Christmas books—I’ve got well over two hundred today, many of them rare, many of them bizarre—and thus began, I figure, the notion that I might want to do something like Flight of the Reindeer one day. For a long time now, two of my favorite Christmas readings have been the calm reminiscences by Truman Capote and particularly Dylan Thomas. A Child’s Christmas in Wales seems to me a wonderful evocation of the days leading up to The Day, as seen through a child’s eyes: It has that magical perspective that Frank McCourt mastered in Angela’s Ashes. It is funny and entertaining and touching without being mawkish. It captures time and place, as well as person. Last year, for some reason probably having to do with age, I got on a Dylan Thomas jag. It started with a re-reading of the Child’s Christmas text in my first-edition copy of Thomas’s prose omnibus, Quite Early One Morning. One past Christmas, a friend had given me a disc of Thomas reading the piece in that sonorous voice of his, and I downloaded this, as well as John Cale’s musical interpretation of his fellow Welshman’s reminiscence. In the evenings, I would take half-hour jogs through the illuminated neighborhood and that was just enough time for another spin through Thomas and a little bit of Cale. Night after night after night. Thomas’s memories started spurring my own, and after showering I would type a few things in the bedroom before joining the family downstairs. Pretty quickly, I had a completed sketch. I was doing this for myself, my wife and our kids, wondering if there might be any value to having this for their shared footlocker. Even though I wasn’t thinking of polishing the piece, I almost immediately realized that there was no profit in aping Thomas. At first, I found myself copying his rhythms and even rhymes, and I realized this would just lead to a pastiche—a college humor magazine parody. I threw that stuff out. Ultimately, I borrowed the idea of his lede paragraph and that of his ending graf, and I stole his brief joke about Leonardo, which I thought was terrific. But the rest I had to write myself, or so I decided—and once I did, the words came as easily as the memories. The thing was finished, and it was what it was. Last Christmas, it spread just a bit beyond the family. I sent it to my sister and brother, who are part of the story. Mike, Bruce and Barry back home in New England, who are present in one episode, read and professed to enjoy the piece. This of course led to the thinking that some others might possibly enjoy it too. Glenn is sketching as I type these words, and in the Christmas season of 2013, A Child’s Christmas in New England will appear. The experience of doing the thing has been so like that of Flight of the Reindeer—an idea floats down, it becomes fully formed before you know it, it becomes what it is after being enriched by artwork—that it seems these Christmas books exist in an entirely other realm than the rest of what Glenn and I do. They come around when they come around, they’re a pleasure to think about, they’re fun to work on—like cutting or trimming a tree, getting the ladder out to put lights on the house, sneaking out to buy presents. For Glenn and me, they’re like Christmas itself.